Vocalist, emcee, comedienne, percussionist, recording artist, talent agent—all this and more describes the incredible "Big Mama" Sue Kroninger. Born in the 20th century (the exact date was never recorded), Sue has been an entertainer since she was old enough to stand in front of a microphone. After earning degrees in literature and music from the University of California at Davis, she embarked on a career which started in musical theater and has led her through just about every type of musical performance style in existence. Although she wears many musical hats (sometimes quite literally), Sue is renowned for her expertise in traditional jazz. Influenced by great jazz and blues singers like Bessie Smith and Billie Holiday, Sue has performed and recorded with scores of other well known jazz musicians, and has been a headliner at countless jazz festivals around the world, including being honored as the 2005 Musician of the Year at Dixieland Monterey. She is considered by many to be one of the most recognizable figures in Dixieland jazz. She is also considered by many to have one of the most recognizable figures in Dixieland jazz. 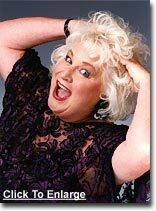 "Big Mama" Sue Kroninger founded her production company in 1988 (officially becoming a corporation in 1990), as a way to promote her music and the music of a select group of musicians from the central California area, through live performances and recordings. Live musical talent booking services for private parties in the San Francisco, Silicon Valley, and Monterey Bay areas. Consultation on style and staging of music for theme parties. Seasonal entertainment featuring costumed performers. Personal bookings of Big Mama Sue for jazz festivals and other public performances. Production, distribution and sales of Big Mama Sue's recorded performances on compact disc and cassette. Our Rent Big Mama Sue & Friends section has complete information on all of the services provided by Big Mama Sue Productions. If you have any questions, comments, or would like to book Big Mama Sue for a personal appearance, contact us at inquiries@bigmamasue.com.